On February 15, 1975, the initial phase of the Lower Granite Dam is completed and water is allowed to begin filling Lower Granite Lake above the dam. The dam is the final dam of a series of four dams built in the Lower Snake River Project, but the controversy about the damming of the Lower Snake River has since continued. Lower Granite Dam is located approximately 15 miles northeast of Pomeroy in Garfield County. For years there had been a dream among those living near the Snake River of opening the river to make it navigable to the Pacific Ocean. Later the dream grew to include utilizing dams to provide an inexpensive power source. The dream became a reality in 1945 when Congress authorized the Lower Snake River Project. The project involved the construction of four dams along the Lower Snake River in Washington state: Ice Harbor Dam, Lower Monumental Dam, Little Goose Dam, and Lower Granite Dam. Lower Granite Dam was the final dam in the project. The Lower Granite Dam, which bridges Garfield and Whitman County, was named for Granite Point, located about six miles upstream (toward Clarkston) from the dam. Lower Granite Dam is 3,200 feet long, making it the second-longest dam of the four dams completed along the Lower Snake River between 1961 and 1975. Preliminary construction started on the dam in July 1965, and proceeded smoothly in the early years. Contractors built access roads, a cofferdam, and worked on the navigation channel. A 1968 photograph of the construction shows the navigation channel already in place. In the late 1960s, two problems began to threaten further construction: First, the United States government refused to increase spending for the dam, and held back funds for civil spending in an effort to fight inflation. Second, the nascent environmental movement began to voice concerns about the dam's effect on the river's fish. In 1969, the environmental movement suddenly gained greater force and public opinion began to shift from its previous overwhelming support for river development to one more skeptical and questioning. An environmental organization, the Association of Northwest Steelheaders, took a lead role in the opposition. In 1969, United States Senators Frank Church (1924-1984) and Len Jordan (1899-1983) of Idaho proposed a 10-year moratorium on dam building on the Snake River above Lewiston, Idaho. The proposal included extending the moratorium downstream to stop construction on Lower Granite Dam. The proposal went nowhere, though in December 1969 the government finally released additional funds for the dam's construction. This prompted the Steelheaders along with seven other environmental organizations to file a federal action in March 1970 against the U.S. Army Corps of Engineers, seeking to stop construction of the dam. The Corps filed a motion to dismiss the suit, while simultaneously refusing to delay further construction of the dam pending a resolution of the litigation. In May 1970 the main construction work on the dam began. There was considerable controversy and back-and-forth among the Corps, the Steelheaders, and other interested parties during the early 1970s. Washington's Department of Fisheries and Department of Game joined in the suit on the side of the environmental groups later in 1970. Unlike the Steelheaders, the State did not seek to stop construction of the dam, but instead sought to require the Corps to consult directly with state fish and game agencies on issues such as the impact to wildlife and compensation measures for losses resulting from the dams. Both construction of the dam and the litigation opposing it moved forward in 1971. Lawyers for both sides argued their motions in Spokane in November 1971 in front of District Judge William Goodwin. The following month, Goodwin filed a Memorandum of Opinion concluding that while Congress had the power to alter or stop construction, the federal courts lacked the jurisdiction to do so. Goodwin dismissed the suit against the Corps. By the end of 1971 the main construction of Lower Granite Dam was nearly 50 percent complete. Both the State and the Steelheaders appealed Goodwin's decision to the Ninth Circuit Court of Appeals in San Francisco. Meanwhile, construction continued, and by the end of 1972 the main dam neared completion. The area above the dam was an historical site as well as an ancient Native American burial ground of the Nez Perce Tribe. The Corps, Washington State University, and other educational institutions as well as local historians from both Garfield and Asotin County assisted in the excavation of the site that the Lower Granite Lake would flood once the dam was completed. It was a two-year project that stretched through 1973 and 1974. About 275 Nez Perce graves were relocated from the area and were reinterred at the Nez Perce Historical Park in Spalding, Idaho. Other artifacts and Native American petroglyphs were excavated and catalogued. At the same time, litigation against the dam continued. The State of Washington and Steelheaders appeal was heard by the Ninth Circuit Court of Appeals in June 1973. In September 1973, the Court reversed and remanded the District Court's decision, sending the case back to District Court for reconsideration. By February 15, 1975, after nearly 10 years of construction, the initial phase of Lower Granite Dam was completed and on that date, water was allowed to start filling Lower Granite Lake. The first of a set of three power-generating units at Lower Granite Dam went on line on April 15, 1975, and an additional set of three power generating units at the dam was completed and online by May 1978. The Lower Granite Dam resulted in the formation of 39-mile-long Lower Granite Lake, which stretches eastward into Asotin County. 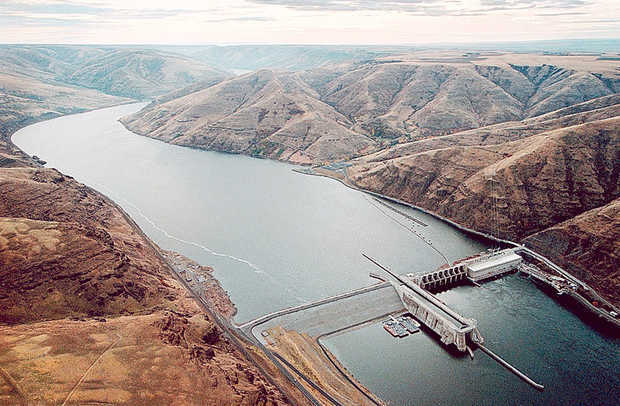 Three new ports, Wilma, Clarkston, and Lewiston were also created as a result of the completion of the Lower Snake River Project, and formally opened to much fanfare on June 20, 1975. The litigation against the dam slowly proceeded in District Court even after the dam was completed and the first three power generating units went online. In September 1977 District Judge Manuel Real ruled primarily in favor of the Corps of Engineers, noting that the construction issue was essentially moot since all of the four dams along the Snake River were by this time in operation. However, Real ordered the Corps to enhance fish runs along the river. The Corps complied by funding studies for enhancement concepts for several years. These studies ended in the early 1980s when government funding for them was eliminated. Navigation on the river initially increased after the dams were completed, but has since declined more than 30 percent since the late 1980s. The dams have, however, successfully generated plentiful and inexpensive power in the region. Litigation against the dams has continued. Dwindling salmon and steelhead runs put the case back in District Court four times between 1994 and 2005, with the Court rejecting several fish-recovery plans proposed by the government. Some dam opponents now (2006) argue the dams should be breached -- something that can only be done by Congressional authorization (bluefish.org notes: this contention remains up for debate) -- but at this time that does not appear likely to happen. Lynda Mapes, "Changing Currents," Seattle Times Pacific Northwest Magazine, March 5, 2006, p. 21-31.